NOTE: Early in 2019 we received reports of Uber drivers showing up, cancelling the ride then demanding cash payments higher than the quoted price. This is against the terms of service, could be dangerous, and should be reported. Unlicensed private taxi services are not legal in Costa Rica. Uber ignored this and began operations in August of 2015. They continue to operate illegally playing cat and mouse with the highway patrol. Update January 23, 2019 – the Costa Rican government is considering a bill to legalize ride sharing. Uber will have to pay a $14 million fine/bribe to mitigate previous illegal operations. The law could take effect in a few months but the taxi drivers union has announced a strike and road blockades in protest. Even if Uber, Lyft and other ride shares are legalized it may be a while before they are useful for tourists in Costa Rica. Drivers are few and far between in many of the places traveler’s want to visit. Frequently there are none. The vast majority of the Costa Rican population and Ubers are concentrated in a megalopolis surrounding the capital San José. Most travelers try to avoid the city only visiting if they have a flight at Juan Santamaría (SJO) airport. Ubers may be available near the airport but drivers are harassed or occasionally attacked by taxistas if they approach the arrival terminal. Riders are directed to haul their luggage a couple of blocks to the bus stop or more often few blocks further to a shopping and restaurant complex for pickup. While Ubers are available in the capital and metropolitan area they are uncommon around national parks, ziplines, ecolodges, beaches or vacation rental homes. In August 2019 and again in early 2019 we did a random sampling in 7 popular tourist spots including Jacó, Manuel Antonio and Arenal/La Fortuna found precisely 1 (one) ride available in 41 attempts at various times of day over five weeks. There was a half hour wait for that one car and there was never an Uber X or Uber Black available. Other travelers have told us that sometimes rides are available from towns like La Fortuna to the hanging bridges or other popular attractions. You must make round trip arrangements ahead of time or risk being stuck because there’s no cell signal and/or no rides available. In cities around the world ride sharing is increasing pollution (studies show Uber has increased total urban miles driven by 25% or more) and serving as fiendishly clever mechanism for funneling money to the wealthy but it is safe, convenient and cheap (temporarily – as the competition is eliminated prices rise quickly). 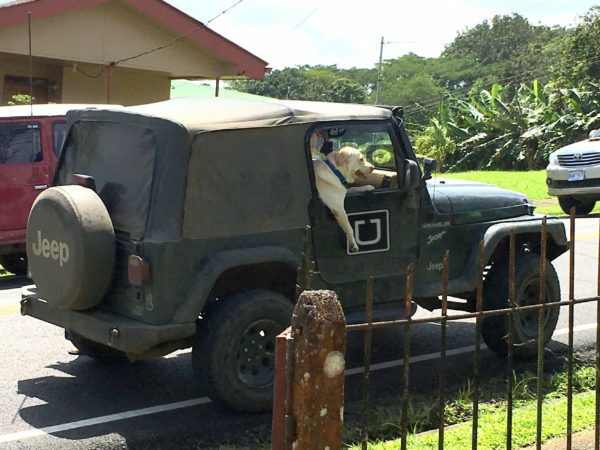 In Costa Rica Uber and other alternative taxi services are still searching for a way to fit in and recently risks to Uber and Lyft riders in paradise have escalated. In late August of 2018 the directors of the Ministerio de Obras Públicas y Transportes (transportation ministry) and Policia de Transito (traffic police) held a press conference to announce that the courts confirmed that ride sharing in general and Uber specifically are definitely illegal under current laws. Uber declined to suspend operations, instead informing users that service would continue as normal and extending an invitation to the government to discuss changing the laws. The transit police were reported to be hassling but not ticketing or detaining Uber drivers. Most of the time the police ignore Ubers but political pressure from the taxi driver’s union prompts occasional enforcement surges. The police either request fake rides (entrapment is perfectly acceptable) or identify Ubers by watching for pick ups and then impound the car by confiscating the license plates. Normally the passengers are told they are “free to go” – in other words left stranded on the side of the road sitting on their suitcases – however, in one recent case two Dutch tourist’s passports were taken and they were questioned and informally “detained” for more than an hour causing them to miss their flight. The main opponents to ride sharing in Costa Rica are taxi drivers. Several times they’ve set up road blocks or organized hundreds of cabs to slow drive or stop blocking highways and main thoroughfares. Confrontations and even violence has accompanied some of the protests. Other times taxistas have identified Ubers in traffic and forced them to the curb. Ride share drivers (and in one case of mistaken identification a completely innocent commuter) have suffered injuries and cars have been totaled by angry taxi drivers wielding rocks and tire irons. We are not aware of any passengers being present when Ubers or other ride shares have been attacked. There’s a third complication for visitors considering an Uber for transportation. One of the few situations where a ride share might make sense is getting from the greater metropolitan area (where cars are plentiful) out to the countryside or vice versa (if you can catch a driver deadheading back to the city). 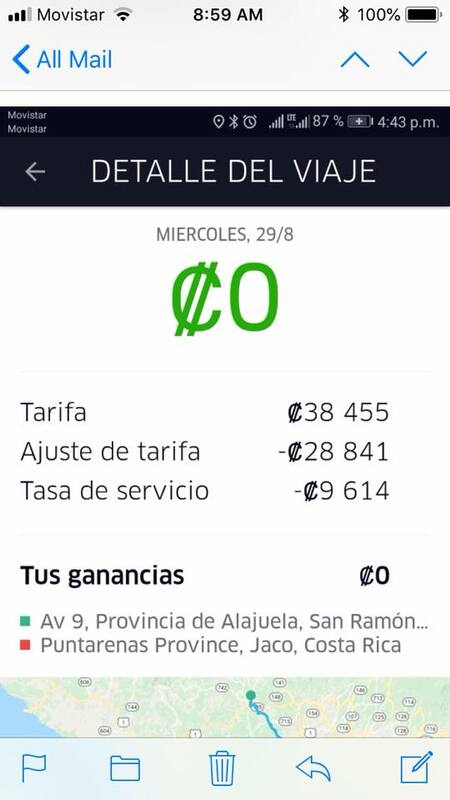 Apparently there’s a common problem with this sort of long ride – it takes so long to get places in Costa Rica that Uber flags the ride as fraudulent and cancels payment. We have not experienced this but a recent post on Facebook received a bunch of “same thing” and “happened to me too” comments. The image above is from the driver’s app but it was the rider complaining that since Uber clawed back the payment (this happened the day after the ride) they had to find another way to pay the driver. Uber has no comment on the practice. 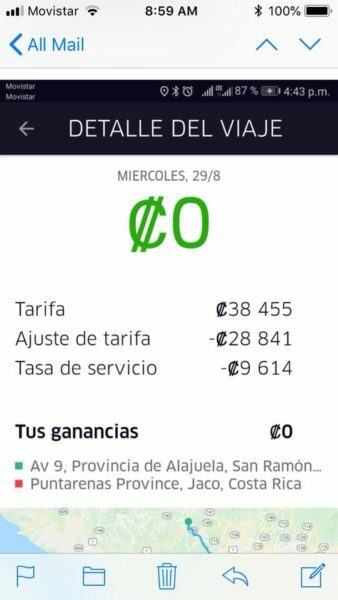 Starting in mid November 2018 the Autoridad Reguladora de los Servicios Públicos (ARESEP) announced that a new ride service called Taxi Shake is available for Android and i-phone operating systems. It’s the “Uber for red cabs”. Red Taxi prices (about $1.05 per km) are roughly twice as much as the cheapest Uber or Lyft fares (starting at $0.56 per km) to the same destination. However the ride shares have variable and surge pricing so a cab may be cheaper at times.